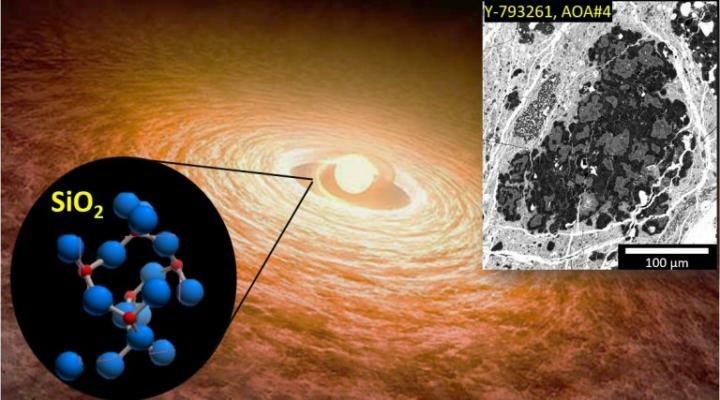 A team of researchers from Waseda University, the Graduate University for Advanced Studies, the University of Hawaii at Manoa, Harvard University, and the National Institute for Polar Research discovered silica mineral quartz in a primitive meteorite, becoming the first in the world to present direct evidence of silica condensation within the solar protoplanetary disk and coming a step closer to understanding solar formation and evolution. Though previous infrared spectroscopic observations have suggested the existence of silica in young and newly formed T Tauri stars as well as in asymptotic giant branch (AGB) stars in their last phase of life, no evidence of gas-solid condensation of silica had actually been found in primitive meteorites from the early stages of our solar system. In this study, the scientists studied the primitive meteorite Yamato-793261 (Y-793261), a carbonaceous chondrite collected from an ice field near the Yamato Mountains during the 20th Japan Antarctic Research Expedition in 1979. "The degree of crystallinity of organic matter in Y-793261 shows that it did not undergo thermal metamorphism," explains Timothy Jay Fagan, professor of geochemistry at Waseda University. "This confirms that Y-793261 preserves minerals and textures of its nebular origin, providing us with records of the early solar system." A major component of chondrites includes refractory inclusions, which formed at high temperatures and are the oldest solar system solids dated. Refractory inclusions can be subdivided into calcium-aluminum-rich inclusions (CAIs) and amoeboid olivine aggregates (AOAs). The research team found an AOA in Y-793261 containing typical AOA minerals and ultrarefractory (very high temperature) scandium- and zirconium-bearing minerals along with the quartz (which forms at comparatively lower temperature). "Such variety in minerals implies that the AOA condensed from nebular gas to solid over a wide temperature range from approximately 1500 – 900°C," Professor Fagan points out. "This aggregate is the first of its kind to be found in our solar system." They also found that the quartz in the AOA has an oxygen isotopic composition close to the Sun's. This isotopic composition is typical of refractory inclusions in general, which indicates that refractory inclusions formed close to the protosun (approximately 0.1 AU, or 1/10 of the distance from the Earth to the Sun). The fact that the quartz in the Y-793261 shares this isotopic composition indicates that the quartz formed in the same setting in the solar nebula. However, silica condensation from solar nebula gas is hypothetically impossible if minerals and gas remain in equilibrium during condensation. This finding serves as evidence that the AOA formed from a rapidly cooling gas. As silica-poor minerals condensed from the gas, the gas changed composition, becoming more silica-rich, until the quartz became stable and crystallized. Professor Fagan says that the origin of Y-793261 is most likely an astronomical object near 162173 Ryugu (commonly known as Ryugu), an asteroid named after a dragon's palace from an old Japanese folktale. Currently being investigated by the Japanese spacecraft Hayabusa 2, Ryugu may share the same properties as Y-793261 and potentially provide more records on the early solar system. "By combining ongoing research on meteorites with new results from Ryugu, we hope to better understand the thermal events and transfers of mass that occurred during the beginning stages of our solar system." This study was published online in Proceeding of the National Academy of Sciences of the United States of America (PNAS) on July 2, 2018 (EST).